Last updated on February 15, 2018 April 25, 2018 by Daniel Waldron for Armagard Ltd. Imagine a touchscreen sign that continues to function despite a scratched screen, can withstand the elements of the great outdoors, and maintains its robustness despite constant usage. Whether your business needs touchscreen signage for an outdoor event or an indoor environment, Armagard recommends Touchscreen Digital Signage complete with projected capacitive touch foil technology. Digital signage has taken giant strides in terms of innovation and technology, allowing for a more interactive means of signage. The benefit for business is that such innovations have enhanced interaction with employees and the consumer audience alike. 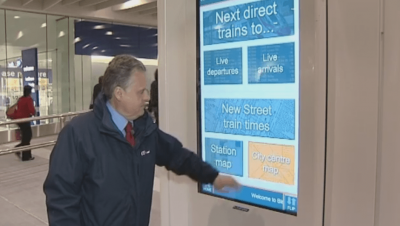 So what’s new in Touchscreen Digital Signage? What’s Available in Touchscreen Signage? The consumer is familiar with touchscreen technology, after all it’s utilised on a number of mobile devices including iPhones and iPads. However, what the average consumer is unfamiliar with is the technologies used that enable the touchscreen function to operate. Armagard applies capacitive touch foil across its whole PDS range and in doing so the capabilities of interactive digital signs have been greatly enhanced. How do Projected Capacitive Touchscreens Compare? Arguably the two greatest attributes of projected capacitive touchscreens are their durability and versatility. When compared with the alternatives, the flexibility offered by projected capacitive touchscreens is insurmountable. Infrared and Optical Digital Signage Touchscreens. Vulnerable to sunlight and bright light, unable to function in wet environments, unable to provide a flat, bezel less finish, unable to function with onscreen inclusions, not robust in design and susceptible to vandalism. Surface Acoustic Wave (SAW) Digital Signage Touchscreens. Unable to function when wet, notoriously difficult to install, devoid of a zero bezel option, most functional when a stylus is used and limited on size. Surface Capacitive Digital Signage Touchscreens. Likely to require regular re-calibration, unfavourable of hard stylus usage, not robust & are easily scratched, unusable outdoors and non-functional when operated with a gloved hand. Resistive Digital Signage Touchscreens. Unable to incorporate multi-touch, prone to poor visibility and susceptible to scratches. Given the attributes of projected capacitive touchscreens, the problems identified with other signage solutions have been eradicated. Armagard has been able to implement capacitive touch foil technology across its whole PDS range and as such we are able to offer customers robust, versatile, touchscreen digital signage solutions. Did you know? A capacitive touchscreen panel consists of an insulator, usually glass, which is coated with a transparent conductor. Due to the human body also being a conductor, touching the surface of the screen means that the screen responds to human interaction. How will Armagard’s Touchscreen Signs Benefit Your Business? Furthermore, the capacitive touch foil technology can be applied to all our Touchscreen Enclosures meaning that any screen that a client installs within a signage enclosure will have touchscreen capabilities. Customers are not restricted by having to have a custom made screen, making capacitive touch foil technology a cost effective digital signage touchscreen solution. Digital Signage Touchscreen is fairly new to the market and in choosing this signage option your business will be joining a growing and innovative trend in interactive media that will engage your employees and your customers alike. Ultimately, the benefits of projected capacitive touchscreens outweigh the combined benefits of all other solutions. Projected capacitive touchscreens provide an updated mode of digital signage offering interaction, data gathering capabilities and a durability and versatility that is unsurpassed by the alternatives. Signage solution capabilities of the current era allow businesses to monitor the effectiveness of their signage efforts, a solution enhanced by the introduction of touchscreen technology. Data capture is paramount for many businesses as it opens up new platforms and offers an insight into the habits of employees and consumers alike when interaction with digital signage touchscreens takes place. Touchscreen digital signage solutions, especially projected capacitive touchscreens, have been embraced by a number of industry sectors meaning that there is huge potential for your business to join a growing trend and steal an edge on competitors. For multi-purpose signage use, particularly as touchscreen digital signage becomes more prominent in the outdoor arena, the combination of capacitive touch foil technology and Armagard digital screens represents the best solution on the market for businesses. Signage that is safeguarded, reliable and versatile gives businesses a myriad of options for deploying digital signage outdoors. Is your business about to host a major outdoor event? Then projected capacitive digital touchscreen signage is the most viable option for alerting consumers to your brand and is a modern and contemporary way of promoting your business to the world. Projected capacitive digital touchscreen signage represents the future of outdoor signage. Offering superior benefits compared to the alternatives, the versatility and robust nature of such signs make them the perfect solution for any outdoor or indoor location. Require advice on signage solutions? Call 1-866-434-0807. This entry is filed under Digital Signage, Touch Screen. You can follow any responses to this entry through the RSS 2.0 feed. Both comments and pings are currently closed.